This month's meetup was once again held at the Facebook office. With the pizza and drinks arriving in good time everyone tucked in and got chatting. Robbie McCorkell (@robbiemccorkell) kicked proceedings off by announcing a new we love tech meetup where all things tech are discussed. He also announced a react native for beginners event. Next, Elianne Schutze was welcomed onto the stage to start her talk. Elianne (@elibelly) gave a straight-talking account of some of the technology and processes she uses day-to-day at the Trainline. Slides peppered with gifs, a whirlwind tour of some advanced Redux tools, RxJS and redux-observable epics showed off their power when dealing with pesky and unfortunately common situations in react applications. Whether it's observable streams of actions or cats. Alex (@Alex_Lobera) passionately talked about his experiences testing React applications. 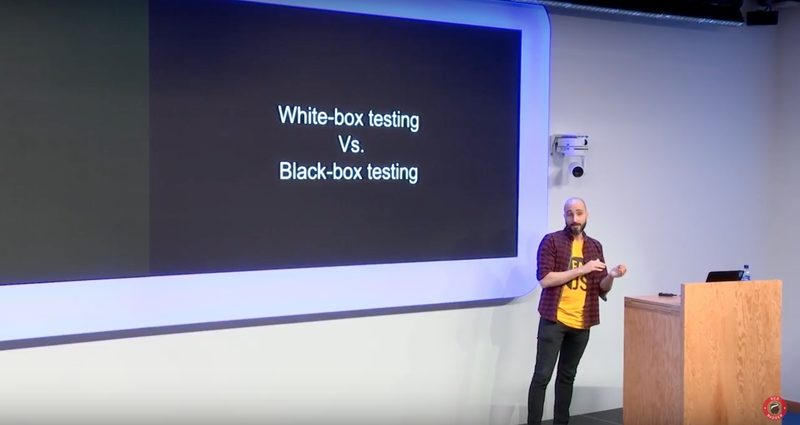 He argued the case for the often neglected integration specs and went through some tools and hacks he uses to help both ease the pain and speed up the integration testing process. Alex was pulling through the errors into the test suite rather than relying on browsers to simulate the errors. He would also only render the relevant children to help keep the specs as lean as possible which seemed like a big win. Clément had struggled with some slow React applications in the past and gave us some great tips for debugging the performance of our React applications. He advised using pure react components as standard, leveraging Chrome's performance tab and using some profiling libraries such as the passive aggressive why-did-you-update. Now he keeps performance in mind as part of the code review process which has helped keep his apps running fast. Thanks to everyone who made the meetup possible. The speakers for their wonderful talks, Facebook for their great office and everyone else who came to listen and ask questions. If you’d like to come along next time then just head over to meetup.react.london and if you're interested in talking at a future meetup then please submit your talk here. That's it for now, until next time.